Thermometers designed specifically for taking animal body temperature. 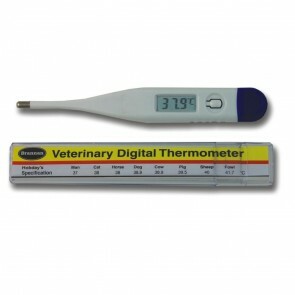 Veterinary Thermometers or Vet Thermometers are designed for the accurate assessment of animal temperatures. In a similar way to humans, a clear indication that an animal is suffering from an infection is a change in body temperature. Traditionally mercury thermometers were used for testing body temperatures, however mercury in glass thermometers were banned for medical use in the EU in 2009. An animal thermometer is very easy to use and shaped so as provide the minimum discomfort to the animal. They are also extremeley accurate (+/-0.1°C between 35 and 39°C). The Veterinary Thermometers are supplied with Hobday chart detailing the normal body temperatures of a number of different animal.